On 30-31 March 2015, the city of Athens hosted the first meeting of the SEAAA Mobility Platform. This international meeting aim was to discuss the creation of a common fund for the mobility of artists and cultural operators between the various regions involved. The leading partners of the project – Roberto Cimetta Fund, Korea Arts Management Service (KAMS) and Australia Council for the Arts –, together with Theatre Entropia, various international organizations, several representatives from the Arab world and Greek operators, chose to meet in the Hellenic capital both for its geographic in-betweenness and as a stance taking in favour of culture in a time of a deep socio-economic crisis. The regions involved – Southern Europe, the Arab world, Asia and Australia – represent both the focus areas of the partners (e.g. the Mediterranean region and the Arab world are the priority areas of the Roberto Cimetta Fund) and the organizers' intention to extend new partnerships through different continents. Participants of the Athens meeting included representatives from India Foundation for the Arts (India); Valletta European Capital of Culture 2018 (Malta); Russian Theatre Union (Russia); India for Transformation (India); Kulturanova Foundation (Croatia); Vasl Artists’ Collective (Pakistan); European Cultural Foundation (The Netherlands); Art Moves Africa; Theatre Entropia (Greece); Zoomal (Lebanon); National Commission for Culture and the Arts (the Philippines); More Europe (Belgium); Nabdh/Pulse (Tunisia); French Ministry of Culture and Communication (France); Al Harah Theatre (Palestine); Vyrsodepseio (Greece); Tamasi Network (UK/Egypt); Asia-Europe Foundation (Singapore); Roberto Cimetta Fund (France); Korea Arts Management Service; Australia Council for the Arts; as well as several Greek operators. With a clear will to enhance and strengthen the cultural connections between Europe and Asia, the Asia-Europe Foundation (ASEF), through its Creative Networks Programme, has supported the launch of the platform and this first gathering of international partners. The alliance of artistic and cultural mobility funding or re-granting organisations – an ambitious and much needed project – has the promotion of discussion, knowledge sharing and the future launch of a new mobility fund among its main goals. The path toward increased cooperation and knowledge in the field of artistic and cultural mobility had already been traced in previous meetings in 2013 in Prague (Czech Republic) and in 2014 in Melbourne (Australia) . A growing number of organizations and international institutions are currently investing and reflecting on this challenge, on the need to increase mobility projects in order to enhance understanding between regions and to improve working and research environments for artists and cultural professionals. If the previous meetings of Asian and European cultural mobility funders and stakeholders, clearly showed the strong mutual interest in organizing common projects – between and beyond the two continents –, the latest meeting in Athens took a step forward in this long-term process. The concrete aim now, as already mentioned, is to set up a common fund to support artistic and cultural mobility in a broader geographical context. The urgent need to create new encounters, draw new routes on the world map, experiment with innovative exchanges, invent new funding schemes and economic models, question globalization and consider proximity, raise awareness of other realities, as well as envisage, conceive and practice alternative cultural maps, were the main matters discussed during the meeting in Athens. 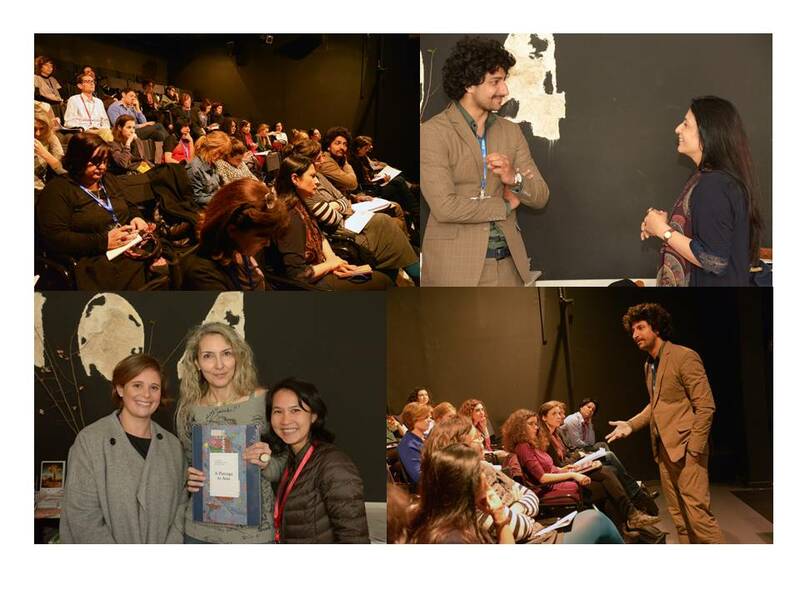 The intensive two-days seminar, held at Theatre 104, brought together over 40 professionals from approximately 24 different countries. The meeting was developed through several sessions, from project presentations to intensive workshops focused on the analysis and discussion of topics related to cultural mobility. The engagement of the participants in the diverse phases of the seminar fostered a valuable context for networking, encouraged critical debate, and paved the way for the construction of long-term collaborations. "Getting the truth": the importance of face to face meetings to share knowledge and experiences. The fair-trade approach in relation to culture. We need to practice and advocate for a fair, sustainable and ethical approach in the field of cultural exchange. The importance of addressing the current changes at global, national and local levels with a three-dimensional approach that links culture with different territorial needs, dynamics and methods. The need to understand the challenges of evaluating and measuring the effect, impact and sustainability of mobility actions. The importance of the “pay-back” step: artists need to come back and share their experience with the community of origin. The role played by local authorities which are increasingly playing an important role as funders in Europe. The holistic approach: we need a complete chain where everyone can work together. These introductory insights set the tone of the meeting and fostered the discussion among the participants. Three simultaneous workshops addressed three specific areas and topics: 1) Performing Arts; 2) Operators and Entrepreneurs; 3) Proximity. Many interesting ideas emerged from the three workshops: in relation to “Performing Arts”, the participants stressed the need to support artists, professionals and companies throughout the entire process, not only the final outputs. Essentially linked to this point is the importance of evaluating the process and consequently inventing more flexible tools of doing so as well as understanding the impact of a grant. The workshop on “Operators and Entrepreneurs” was mainly focused on issues related to local cultural development and sustainability. Most of the participants agreed that economic criteria should not be the only parameters for evaluating cultural development. Other points raised from the discussion concerned the need to understand and analyse rapidly changing demographies, the critical relationship between art and education, and the differences between tourism and other mobility models. The third workshop on “Proximity” gave way to an intense and fruitful debate. Many artists and cultural professionals expressed their growing interest in experiencing other geographical transits rather than the usual big cities (the so-called golden triangle). A “km-zero” strategy – privileging the local over the global in exploration of other mobility routes within cities, linked to ideas of periphery, decentralization and sustainability – are issues that should be addressed and fostered by mobility funders and stakeholders. The final sessions were focused on economic models and funding schemes (existing or to be invented), where different mechanisms – including the opportunities provided by the crowdfunding model – were analysed. This first meeting of the SEAAA Mobility Platform was definitely necessary to discuss the urgent matters at stake across different latitudes and, above all, was an essential starting point, a sowing of seeds, to create a solid and common Alliance. In this light, it is certainly relevant to mention the Canary Islands Declaration on Culture and Artistic Mobility, a common framework agreed by six independent cultural mobility funds from different areas of the world, who together agreed to work as a coalition for the advocation and dissemination of the principles stated in the Declaration. Thus, the Canary coalition can be viewed as the precedent to the SEAAA Alliance. Even if the times required to develop a new mobility fund will be long and complex, and even if there are many different approaches and ways of understanding terms, concepts and mechanisms, the Athens meeting demonstrated that there is a clear and shared commitment to work together toward the creation of a common fund. Beyond the sharing of common values, the new Alliance should set up a joint open call for artists and cultural operators, those who will be the real beneficiaries of the fund by accessing new and stimulating mobility opportunities. Furthermore, all the participants agreed that cultural mapping is a necessary action that must be supported and fostered. New alliances, new encounters and new mobility routes are waiting to be explored and experienced. The wide and diverse framework of the SEAAA Mobility Platform reminds us how necessary it is to connect, partner, explore, move around and think together on a global scale, as well as to develop a local focus and the politics of proximity based on sustainable models and strategies.